You’re Getting Old! 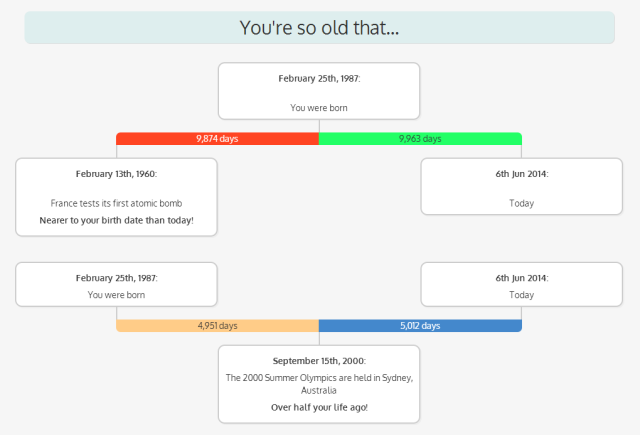 is a fascinating website that offers facts and statistics relating to a person’s lifetime once their date of birth is entered. For example, someone born on February 25th, 1987 is currently 9,963 days old, and they were 13 when Wikipedia launched. The website also includes a pie chart featuring an approximation of how many people born on that date are currently alive versus dead as well as many more features. Do you think time is catching up with you? Perhaps it’s already overtaken you and left you in the dust. Do the years seem to be going ridiculously quickly now? There’s a reason for it. You’re getting old.